I just love playful baby monsters and I thought that would be fun to do for a nursery. 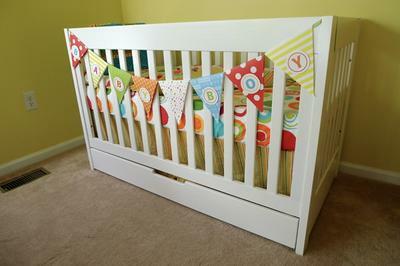 Especially since it would be from scratch instead of just buying a pre-designed nursery theme. Babyletto Mercer Crib from Babies 'R Us. Babyletto Mercer Dresser from Babies 'R Us and Expedit Shelf from IKEA. Summersault Geo Brights from Target.com. 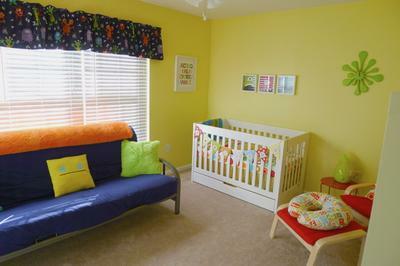 The valances really pull in the monster nursery theme. These were found on ebay after finding a baby bedding set in the same pattern at a discount store. The monster lamp was also a perfect addition to the room and was found after doing an internet search for "monster". The artwork is DIY because I'm a graphic designer. 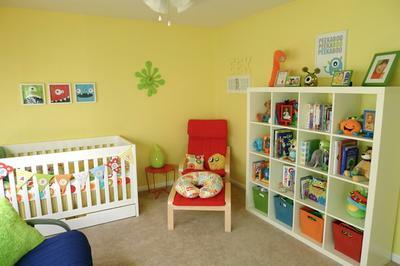 It really makes this a one-of-a-kind nursery! 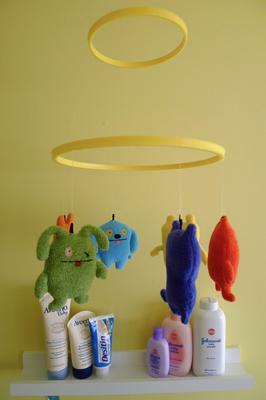 Thanks to Uglydolls, I was able to make an original mobile to continue the monster theme over the changing table. The Expedit shelf from IKEA was perfect. It fits anything from books to toys to stuffed animals. It really is a store-all shelf. The baskets were from Land of Nod and really help bring in the variety of colors. I started as soon as we found out we were having a boy at 12 weeks. I LOVE bringing an original idea to life so it has been fun. Frustrating at times, but still fun! My favorite part was seeing it all come together in the end. I love that it is like no other nursery out there. My little man gets his own one-of-a-kind room!